Katherine Baum, PhD, is a pediatric neuropsychologist with the Child and Adolescent Psychiatry and Behavioral Sciences at Children's Hospital of Philadelphia. 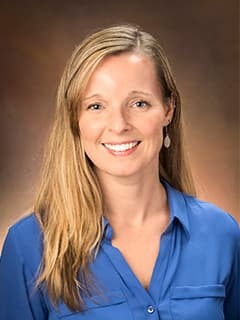 Katherine Baum, PhD, a pediatric neuropsychologist, is part of Children's Hospital of Philadelphia's Inpatient Acute Rehabilitation and Day Hospital Rehabilitation programs, which serve patients in acute stages of recovery. Her recent clinical and research interests have been in defining and developing various models of neuropsychological care for complex medical populations. Baum, K. T., Shear, P., Howe, S., & Bishop, S. (2015). A comparison of WISC-IV and SB-5 intelligence scores in children and adolescents with ASD, Autism, 19(6), 736-745. Leff, S., Baum, K.T., Bevans, K., & Blum, N. (2015). Development, validation, and utility of an instrument to assess core competencies in the Leadership Education in Neurodevelopmental and Related Disabilities (LEND) Program. Maternal and Child Health Journal, 19(2), 314-323. Baum, K. T., Desai, A., Field, J., Miller, L. E., & Beebe, D. W. Ph.D. (2014). Sleep restriction worsens mood and emotion regulation in adolescents. Journal of Child Psychology and Psychiatry, 55(2), 180-190. Baum, K. T., Byars, A. W., deGrauw, T. J., Dunn, D. W., Bates, J. E., Howe, S. R., Chiu, C-Y., & Austin, J. K. (2010). The effect of temperament and neuropsychological functioning on behavior problems in children with new-onset seizures. Epilepsy and Behavior, 17, 467-473. Baum, K. T., Byars, A. W., deGrauw, T. J., Johnson, C. S., Dunn, D. W., Perkins, S. M., Bates, J. E., & Austin, J. K. (2007). Temperament, family environment, and behavior problems in children with new-onset seizures. Epilepsy and Behavior, 10(2), 319-327. Bardgett, M. E., Baum, K. T., O’Connell S. M., Lee, N. M. & Hon, J. C. (2006). Effects of risperidone on locomotor activity and spatial memory in rats with hippocampal damage. Neuropsychopharmacology, 51(7-8), 1156-1162. McNutt, K. T. & Bardgett, M. E. The effects of entorhinal cortical lesions on alcohol preference in rats. (2006), The Norse Scientist, 4(1), 69-74. Austin, C. A., Gerstle, M., Baum, K.T., and Beebe, D. W. (2017, February). Parent expectations and change in parent efficacy for pediatric neuropsychological evaluations. Poster presented at the annual meeting of the International Neuropsychological Society, New Orleans, LA. Leblond, L., Raj, S.P., Narad, M. E., Shultz, E.L., Salloum, R., Baum, K.T., Platt, A., Thompson, A., & Wade, S. L., (2017, February). Developing an intervention to promote quality of life in pediatric brain tumor survivors. Poster presented at the annual meeting of the International Neuropsychological Society, New Orleans, LA. Powell, S. & Baum, K. T. A tiered approach to neuropsychology services at a pediatric academic medical center. (2016, March).Oral presentation at the annual meeting of the Midwest Neuropsychology Group, Evanston, IL. Baum, K. T., Powell, S., Gragert, M., Jacobson, L., Janzen, L., Paltin, I., Rey-Casserly, C., Wilkening, G., & McCabe, M. (2016, June). Guidelines of neuropsychological care in pediatric oncology: Practical clinical applications. Poster presented at the annual meeting of the American Academy of Clinical Neuropsychology, Chicago, IL. Van Dyk T.R., Baum K.T., LeBlond E.I., Manegold E.M., Strong H., Beebe D.W. (2016, June). Short sleep induces variable mood in adolescents. Poster presented at the annual meeting of the American Academy of Sleep Medicine, Denver, Colorado. Baum K.T. Cognitive Effects of Chemotherapy in Survivors of Childhood Cancer. Invited presentation for cancer survivors as part of symposium, Cancer Effects on Memory and Thinking, Cincinnati, OH.